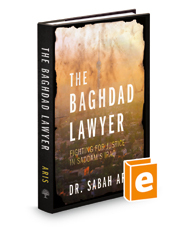 Published by the American Bar Association (ABA), The Baghdad Lawyer is a memoir like no other. For the first time ever, experience the behind-the-scenes workings of the Iraqi criminal justice system from the perspective of one of the most respected trial lawyers in Iraq, in the years before and during the violent and chaotic rise and fall of Saddam Hussein. In a career spanning fifty years, Dr. Sabah Aris has been shot in the head, forced to brandish a revolver to prove a point in court, witnessed an act of cannibalism, defended Saddam Hussein's notoriously unstable and violent son Uday, and more than once has found himself at odds with, and at, the mercy of Saddam's all-powerful Secret Service, the Mukhabarat. The world Dr. Aris describes brings to mind the lawlessness of the American West, where justice is often meted out according to tribal and religious doctrine, where the gun or the knife or family and tribal affiliation is more powerful than the rule of law, and where a three-minute call to the presidential hotline (something like a 1-800 number that was often answered by Saddam Hussein himself) could determine the outcome of even the most seemingly hopeless cases. The Baghdad Lawyer depicts the challenges of trying to find justice in the shadow of constant political upheaval and the lawlessness this upheaval engenders. It also helps us understand where Iraq is as a country today – post-Saddam, post-Iraq, and in the age of ISIS – and how the events we currently read about in the headlines were seeded years before the world had ever heard of Saddam Hussein. While this book is by and about one of Iraq's most famous trial lawyers, it is also, perhaps more importantly, about the Iraqi people and the country itself.